The EFF leader listed many well-known journalists he alleges are far too loyal to certain politicians, particularly Gordhan. 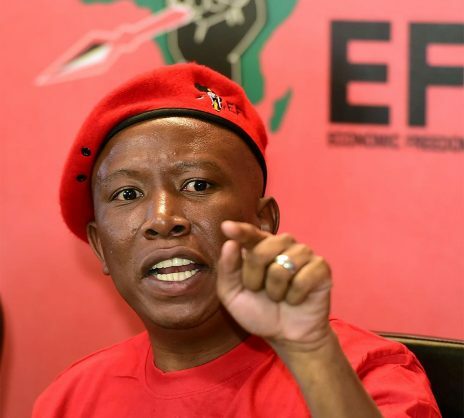 Some of the media’s reaction to the EFF’s challenging of people, including Public Enterprises Minister Pravin Gordhan and treasury deputy director-general Ismail Momoniat shows that they are forming a pro-Ramaphosa mob, Julius Malema alleged on Thursday. Speaking at a press conference, the leader of the red berets stated: “You have a group of journalist such as Ranjeni [Munusamy], Ferial [Haffajee], Max Du Preez, Karima Brown and the likes, that have grouped themselves into a mob that will attack you if you saying anything about Ramaphosa. “Floyd challenges (Momoniat) and the mob attacks Floyd even before they can get all the facts. Before the end of that, Floyd gets a tip-off that Sars [the SA Revenue Service] will be launching an inquiry into EFF leadership”, Malema claimed. Malema dispelled any criticism that the EFF’s adoption of causes was partisan or driven by an agenda. “I was called by journalists from Tiso BlackStar asking us to open a union for journalists. We are fighting injustices for everyone, even for the journalists that write negatively about us,” he said. Malema also spoke out about allegations made by The President’s Keepers author Jacques Pauw, that alleged tobacco smuggler Adriano Mazzotti had paid the politician’s R18 million tax bill. “I have written a letter to Jacques Pauw to withdraw the statement which he has made that Mazotti paid my tax. We have never denied as the EFF that Mazotti paid our registration fee in 2014,– that we have never kept a secret,” Malema said, but he took issue with Pauw’s further speculation. Malema said that despite his recent comments on Gordhan, who he believes represents a neo-liberal agenda and is removing and appointing people without following proper processes, he does not have a vendetta against the minister of public enterprises. “We defended Pravin when Zuma spoke against him. I was not going to sit back and allow an injustice to be done to him because he did the same to me. Pravin wanted to destroy me but I still had the courage to defend because I am inspired by justice,” said the EFF leader. Likewise, Malema says that if he comes out in support of suspended Sars boss Tom Moyane, it should not be seen as a sign that his allegiances have changed. “When there is an injustice against Tom Moyane, then we will address it. He may be forced to defend himself on the issue twice; we are saying there shouldn’t be, seemingly, a double jeopardy that arises,” said Malema. The head of the Sars commission of inquiry Judge Robert Nugent has, however, dispelled the idea that there is any risk of double jeopardy in his inquiry into Sars. Advocate Dali Mpofu suggested that Moyane should not be facing an internal disciplinary hearing at the same time as the Nugent inquiry. Nugent countered that this would only be the case if his inquiry was a trial, which it isn’t, and he is investigating problems at Sars in general, not Moyane in particular. “However, whatever the outcome, Moyane should go because he stood in support of a kleptocratic state,” Malema added, confirming that he does not want his comments regarding Moyane to be taken as support for the suspended Sars boss.